The Bentley Historical Library has a Mellon grant which is sponsoring development on the foundational project to create an Appraisal and Arrangement tab. 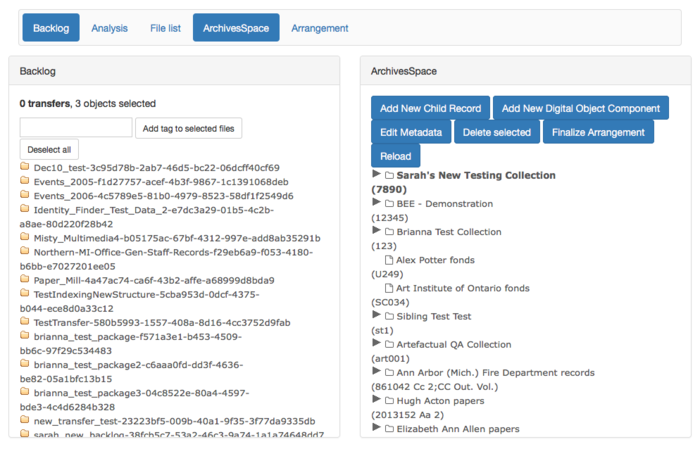 This tab will function as a place between Transfer and Ingest where archivists can make archival appraisal decisions with material from Transfer, and structure an arrangement for the SIP before starting Ingest processes. 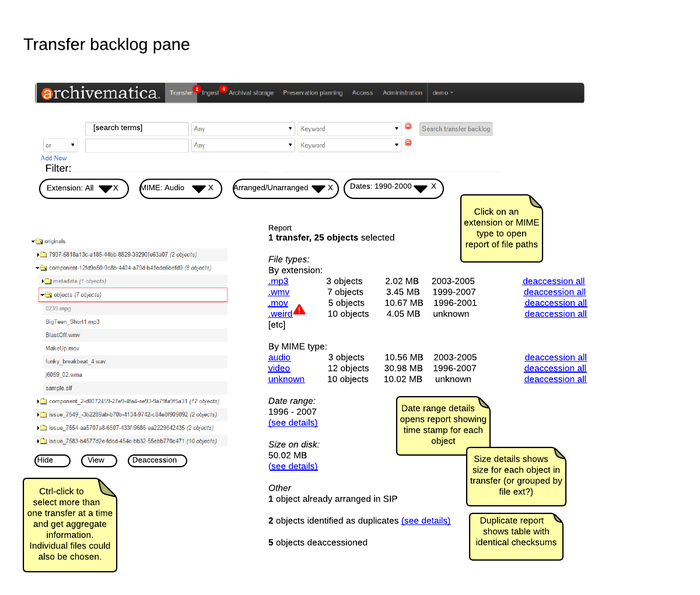 As of the Archivematica 1.3.0 release, the arrangement/appraisal decisions are made at the top of the Ingest tab by selecting transfers from the backlog for arrangement. This process, including the transfer backlog search, is to be moved into the new Appraisal and Arrangement tab. Mid-way development feedback is available as a narrative here and as an itemized spreadsheet here. What data points about the objects themselves? Filename, format, MIME type, other? How many resources and at what level should be loaded in the tab? What options does the user have to search for existing resources? How does the user create a new resource? What data points are displayed (labels, level of description, other)? What are the requirements for querying or filtering the data gathered above? 1. Is it necessary to be able to filter by format or PUID from the backlog, or only from the refined list? User then filters the selected transfers by a specific file type, which populates the File List pane? Answer: Selections from the backlog pane inform what shows up on the analysis pane and selections from the analysis pane in turn inform what shows up in the file list. Actually, that's why we'd like to be able to click on more than one piece of the pie at a time, or on more than one file type from the report at a time, or on a FPR group. 2. From where does a user drag files in order to create a SIP? From backlog, the File List pane, or both? Answer: In our discussions, the user would drag and drop from the backlog. This is because, at least for us, arrangement will most likely be based on the original directory structure or the tags we've applied, but probably not often on something like file format or type (important for appraisal to be sure, but not so much, at least for us, for arrangement). As such, dragging and dropping right from the file list isn't something we really considered. As an archivist, I need to move files dragged to a resource in the ArchivesSpace pane to different locations in the arrangement, so that I can change the arrangement as new relationships become apparent. Without this ability, I would need to think about and note the arrangement of files before beginning to drag them from a package in the backlog and would not easily be able to fix mistakes. As an archivist, I need to drag a folder of files from a package in the backlog to the same digital object component, so that I can easily add large numbers of items to a resource without having to move each file individually. For this reason, I also need to be able to drag multiple selected files within a folder from a transfer package to a digital object component. As an archivist, I need to be able to control the order of items grouped under digital object components in the Appraisal tab, so that I can order the items in a way that is meaningful to understanding the files and/or conducive to users finding items. It would be helpful if Archivematica defaulted to sorting alphanumerically by filename but also allowed me to change the order manually. New functionality identified during this period includes tagging content while processing the backlog, as an "aide memoire"- in this example, a reminder that some material will be discarded from the accession. 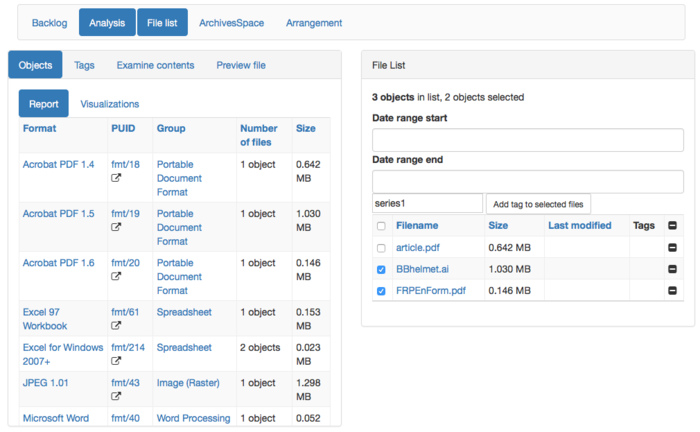 Detail of potential ArchivesSpace workflow- editing metadata to change title, date, level of description and general note. 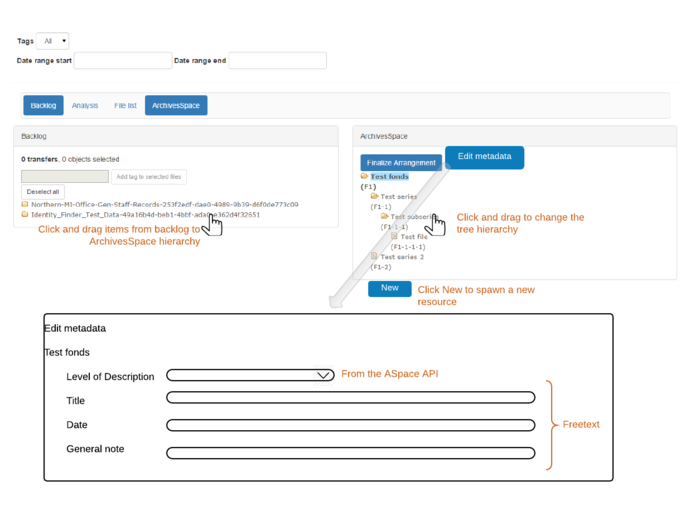 Files from packages sent to the backlog in Archivematica can be dragged to digital object components which have been added to archival objects in the ArchivesSpace pane. 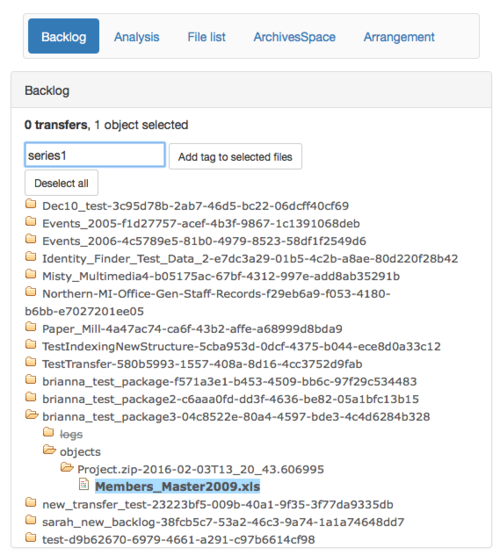 Tags can be added to files in the backlog. Files selected in the backlog appear in the Analysis pane which can be used to populate the File List pane. Tags can also be added here. The Analysis pane also includes options for creating visualizations. An initial mockup of the appraisal tab has been started, developed as an Angular.js app. The code is available on github. The basic idea is to create an Angular app, that communicates with the Archivematica Dashboard via its REST api. This page was last modified on 23 March 2017, at 15:27.